Lady luck has struck in the same place for one North East company, after staff won the lottery for the second time. Sahaviriya Steel Industries (SSI) is one lucky place to work, after a 27-strong syndicate scooped £1m in the EuroMillion UK Millionaire Raffle draw on New Year’s Eve. The win comes just three months after a 30-strong syndicate, also from SSI Steel, won £288,743.10 on EuroMillions in September 2013. 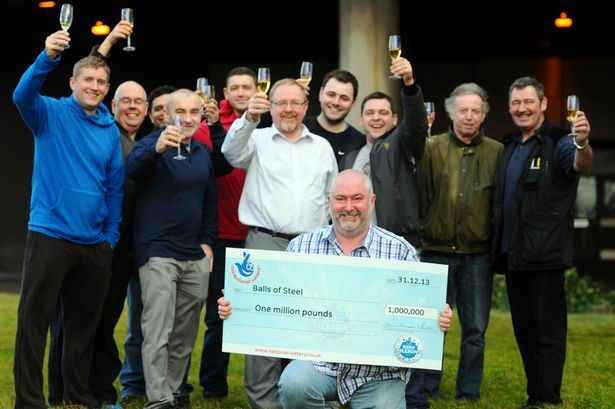 The aptly named Balls of Steel syndicate, who all work as part of the day shift crew at SSI Steel, based in Redcar, Teesside, found out they had each pocketed £37,037 when syndicate leader, Mark Richardson, checked the tickets on New Year’s Day. The 54-year-old said: “I decided to check the tickets on my phone and discovered we’d won £7 on the EuroMillions. “I was struggling to see the raffle codes so I logged on to the computer and printed them off. It wasn’t until I came to the last line that I realised we had a matching number. Once the win had been confirmed the SSI employee immediately called the rest of the syndicate members to tell them the good news. “Everyone thought I was winding them up when I called to say we’d won,” Mr Richardson said. The Balls of Steel syndicate has been playing EuroMillions for two years and have vowed to continue to play. The winning ticket was bought from the Spar shop in Nunthorpe, Teesside. The Millionaire Raffle selection drawn was GRG911485 in the special draw on New Year’s Eve that guaranteed to create 25 millionaires.